This scarf is a story of the ultimate UFO. I started it when some of the first Harry Potter hand knit scarves became a thing on the internet, it was when The Prisoner of Azkaban had come out and the more sophisticated scarf pattern had emerged and everyone wanted to knit it. It was when Knit Picks was still kind of a new thing (it was the only way to afford making this scarf and they had all the colors!). I had knit about 5 feet of that scarf and then it hit UFO status and wound up in a closet. It made its way up north as we moved from GA to VA. 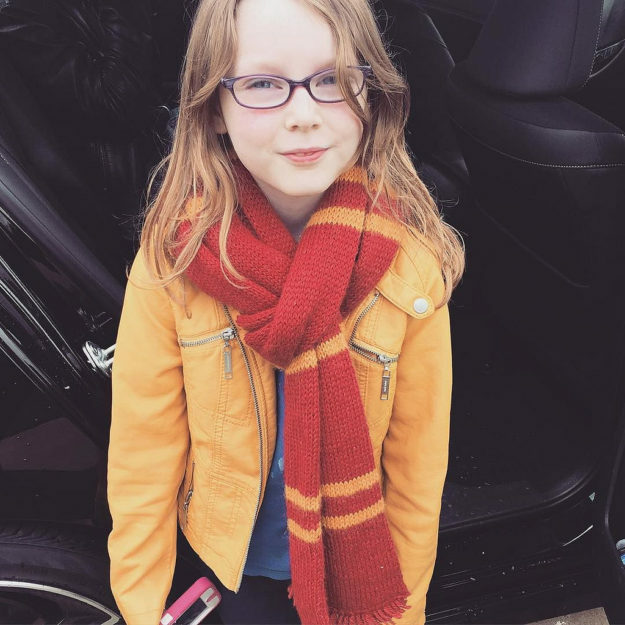 I found it at some point when my daughter had just turned 8 and was reading all of the books and decided she wanted to be Hermione for halloween. It took me a while to find it, we had to go look in storage but I was determined. I kept hoping all of the yarn would be with it so it could be finished. I did finally find it, and I knit the last 2 feet and bound off. It was the craziest feeling finishing something I had started before she was born.